4th Thursday at 7 P.M.
Fun and best buys start at 9 AM; have a great breakfast at the fire department’s pancake breakfast and mosey over to the ranch and be amazed! If you are a vendor, you are in luck. Tables come in multiple sizes and costs to suit all vendors who will be treated to live music, fun and games. Vendors are virtually guaranteed to leave with full smiles and pocketbooks as well! Vendors can view and print the attached entry application and terms. Meet the fire fighters who live in and protect our beautiful valley. All of the fire trucks are polished and lined up for public inspection and ready to jump into action on a moment’s notice. Free jumpey house; ride in a gigantic fire truck, learn about disaster preparedness and other valley non-profits. Socialize with your neighbors as the entire valley comes out for a great breakfast. 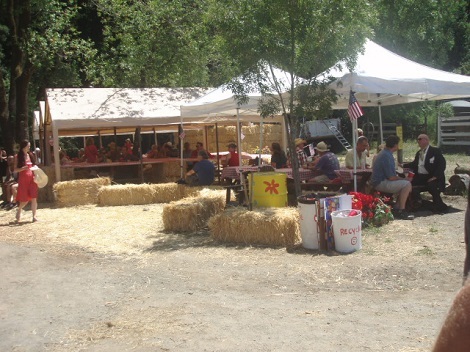 Travel down Railroad Ave. then veer two blocks into Dickson Ranch for burgers, flea market, fun, games and great music. 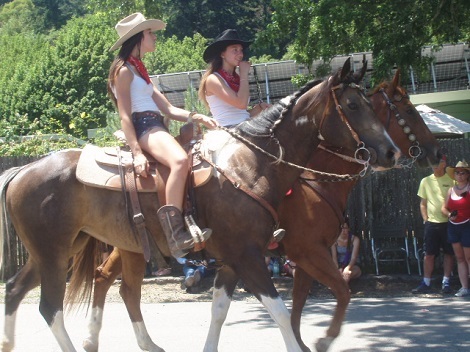 Or just kick back relax and be entertained by a fantastic small town parade. Anyone, yes even you, can join in the parade and mosey, saunter or dance down Railroad Ave. But first submit an application. 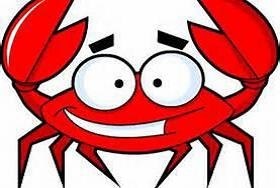 San Geronimo Valley Lions Annual Crab Feed! A Great Time Awaits You! This event sells out - get your tickets early! The first Saturday in February, the San Geronimo Valley Lions help the West Marin Little League (WMLL) get Warner Baseball Field in Woodacre ready for opening Day. In years past Lions members (Jerry Feickert, David O’Conner, David Puglisi and Mike Smith) cleared out overgrown blackberry bushes, weeded, leveled the infield and hung outfield signs. The weather was perfect and we look forward to a great WMLL opening day. 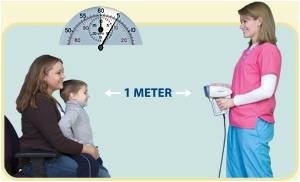 PediaVision® utilizes an infrared camera that combines auto-refraction and video-retinoscopy. From one meter (just over a yard) away, the camera is used to take a digital photograph. The information acquired is used to automatically assess a child’s vision in as little as five seconds. Starting with the month of May, valley residents will begin seeing eyeglass recycling boxes at valley post offices and other selected locations. If you have used eyeglasses you no longer need, you can use these boxes to donate them to a good cause. 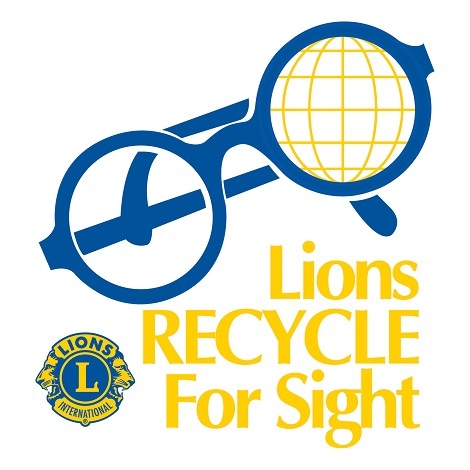 Lions volunteers will collect donated eyeglasses and deliver them to regional Lions Eyeglass Recycling Centers (LERCs) to be cleaned, sorted by prescription strength and packaged and distributed to people in need in developing countries where they will have the greatest impact. 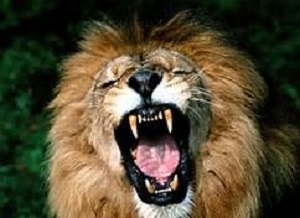 Lions accept prescription and reading glasses, sunglasses and plastic and metal frames. Children's glasses are especially needed. The Marin County Fire Department will hold its annual Fourth of July Pancake Breakfast on July 4 from 7 to 11 a.m. at the Marin County Fire Department's Woodacre headquarters, 33 Castle Rock Avenue in Woodacre. 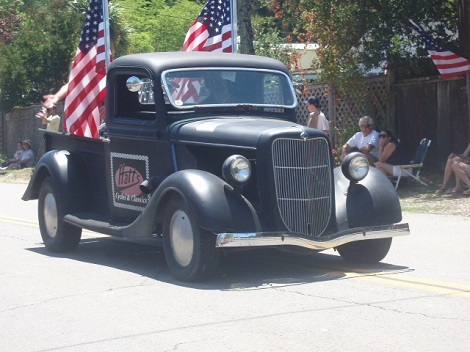 San Geronimo Valley's 38th annual Fourth of July celebration will begin at noon at noon at Woodacre Improvement Club at 1 Garden Way and follows Railroad Avenue to Dickson Ranch at 182 San Geronimo Valley Drive. There will be, games, barbeque and music. The Dickson Ranch is down home country fun. It will include a scrumptious Lions Club barbecue, flea market, horse riding contests, pony rides, a flea market, bingo, gunny sack races, a two-man saw contest, men’s leg beauty contest and a free music concert by the Sky Blue Band. The event is sponsored by the San Geronimo Valley Lions Club.. 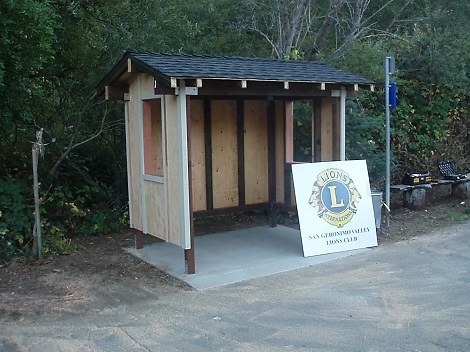 In October 2013, 2014 and 2015 the San Geronimo Valley Lions completed construction of new bus shelter in San Geronimo, Forest Knolls and Lagunitas. These projects, which took years of planning, permits and construction, produced comments of ‘THANK YOU LIONS’, ‘Wow it is beautiful’, Cute Doll House and ‘Great for the winter rains’. Several bus drivers have expressed extreme gratitude for the shelter and are requesting additional shelters in our beautiful valley. OK, there you have it. They throw down the challenge, and we respond with ‘sure, no problem’. Fall Blood Drive - October 11, 2018 at the SGV Community Center. 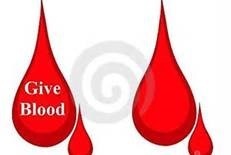 ​Spring Blood Drive in 2019 will be in April/May timeframe. How many Chances do you have to save a life? Now is your Chance!!! The San Geronimo Valley Lions Club is sponsoring two Blood Drives per year and we need your help. There is always a low supply of blood, and this year is no exception. Disasters happen without warning, and when they do blood demand spikes. Let’s prepare for the inevitable. 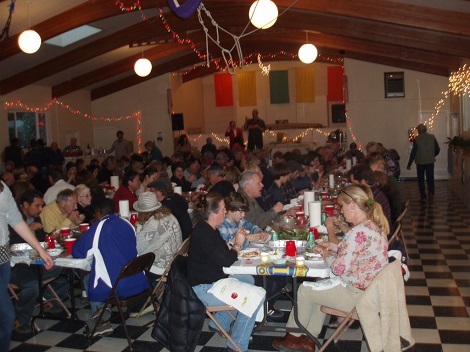 Show everyone that San Geronimo Valley is a ‘Giving Community’, ready to support each other and everyone in need. Actual date and location TBD. 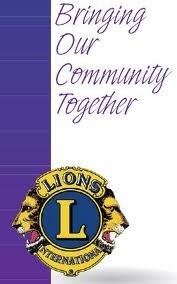 This will be the fourth year the San Geronimo Valley Lions have conducted a Rebuild The Valley Project. It is a joint project of the San Geronimo Valley Lions Club, the San Geronimo Valley Community Center, and West Marin Senior Services. 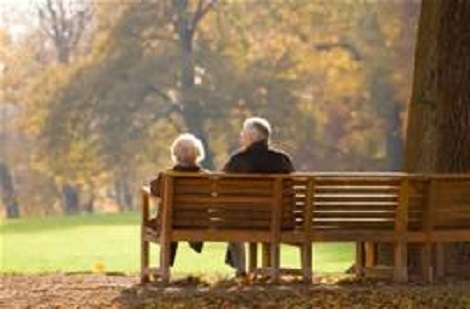 This year, the RBTV project will be at the senior housing on Sage Lane. The Lion house is named for the financial and maintenance support from the San Geronimo valley Lions. In 2013 we made significant safety improvements at the home of an 88 year old man in Forest Knolls. It included rebuilding and improving stairways, improving a pathway by leveling and installing handrails, reworking dangerous electrical wiring, adding basement ventilation and general cleanup and touch up of peeling paint. In 2012 we installed pathways for a wheelchair-bound Woodacre resident, which were much appreciated by the recipient. This was a very enjoyable project for all participants. In 2011 we replaced a deck of an elderly Forest Knolls resident that was in the late stages of decomposition (the deck, not the resident). The project took longer than expected, involved a sizable all volunteer crew over two Saturdays and was a major learning experience for all. October 14 last year the San Geronimo Valley Lions assisted with traffic control, at the annual Lagunitas School cross-country track meet. Over 300 cars showed up to park at a campus that has 1/3 that many parking places. Controlling the predictable chaos was essential as the race course shares the same road as the parking lot. Safety was our top concern and the task was performed admirably. We have agreed to help with this year’s annual event, and we are up for the challenge. Valley Toys and Joys is a nonprofit trust created to bring the magic of the holidays to local children from the San Geronimo Valley and Nicasio. 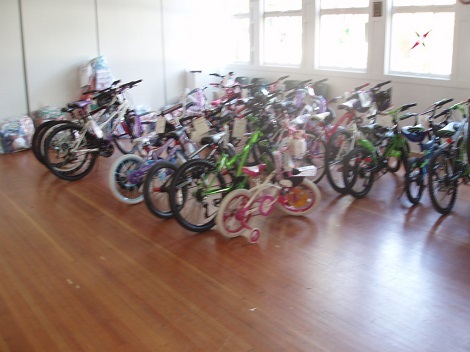 These transformed into holiday elves assist low-income families and those who are in temporary crisis by fulfilling the wishes of the children, whether it be a bike, jacket, book, or Barbie doll. Santa Claus is alive and well in the San Geronimo Valley. The SGV Lions decorate a beautiful Xmas tree at our annual Xmas dinner. 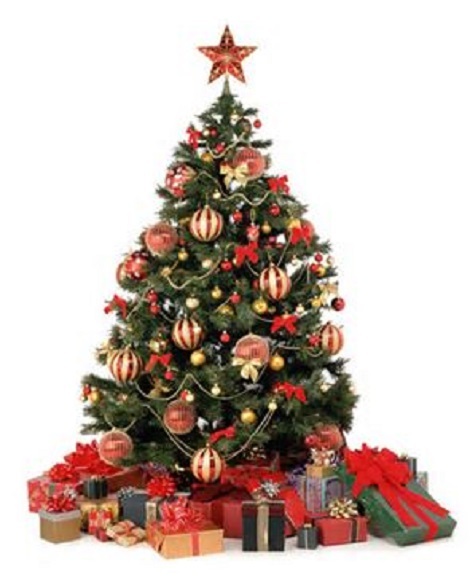 Members bring beautiful ornaments and trinkets to brighten up our tree as well as our spirits. A post dinner tradition is to deliver the tree including all of the donated ornaments to The Fairfax - San Anselmo Children's Center.